Closterotomus norvegicus, more commonly known as the potato capsid, measures 6-8 mm in length and is a species of bug belonging to the family Miridae, subfamily Mirinae. It can be found feeding on nettle and clover as well as compositae, potatoes, carrots and chrysanthemums. They prefer to feed on the flowers, buds and unripe fruit. The species is found all over the UK and continental Europe. 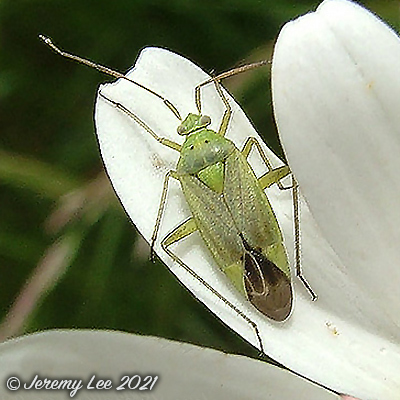 In 1997 it was moved from the Calocoris genus to its current name. The species is green coloured as a nymph but when they get to adulthood they can be tinged reddish-brown. It does however, vary by territory, for example some specimens from northern Britain have been found to be brownish-black. The prothorax has two spots while its scutellum has dark marks. The tibial spines are shorter than the width of the tibia, and the length of the 2nd antennal segment is roughly equal to the 3rd and 4th combined. Adult from May-October.